Roasting is probably one of my fave ways to cook food. It's the most effortless technique in that you just prep whatever you're roasting by seasoning it, perhaps a drizzle of olive oil and letting it get nice and cozy in the oven. Roasting does wonders for various cuts and types of meat, vegetables and even fruit. Even better is when it's done in the fall months and you reap the benefits of delicious smells coming from the oven. During the fall, squash is a big player in my kitchen. I enjoy the deep, rich colors, assorted shapes and sizes they come in but more than that, the flavor that comes from roasting squash. When paired with fruit, the flavor can be even more complex with notes of sweet and savory, while the texture retains a creamy mouth feel. For this dish, I roasted both butternut squash and pears until they were perfectly caramelized before blending with melted butter, chicken stock, fresh thyme, minced garlic and salt/pepper to taste. It makes for a colorful alternative to mashed potatoes with a bit more character. Besides, potatoes can be enjoyed any time of the year... why not let butternut squash and pears have their limelight too in the fall? Split the butternut squash in half lengthwise. Scoop out the seeds and place in a large baking dish, cut side up. Peel and core the pears and place into the large baking dish with the butternut squash, cut side up. If they don't fit, use 2 baking dishes or bake separately. Drizzle the olive oil and sprinkle the salt over the squash and pears. Bake in the preheated oven for 45-60 minutes or until the butternut squash is soft enough to scoop out. The pears may cook faster (check after 25-30 minutes) and when done, remove from the dish and set aside until the squash is done. 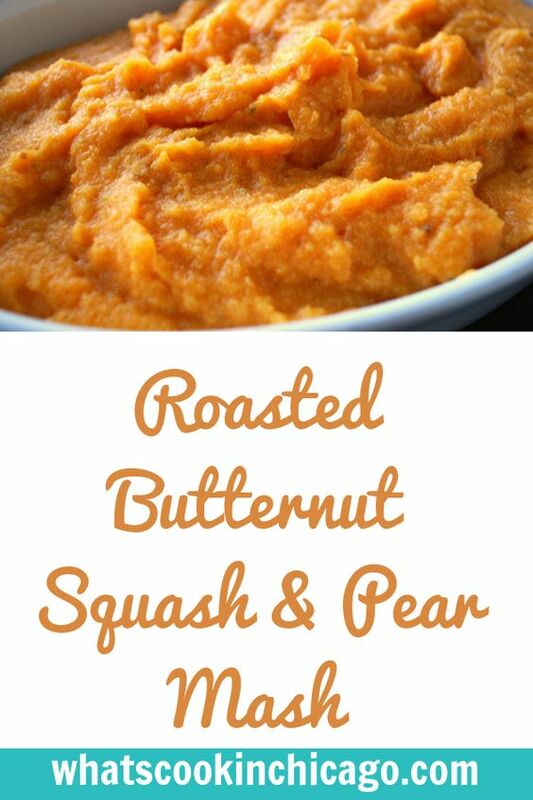 Scoop out the butternut squash and place in a food processor along with the roasted pears with the garlic cloves. 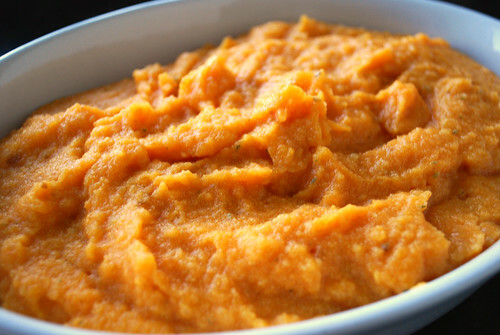 Process until you have a puree. Slowly add the chicken stock and melted butter as it processes. Continue to process until smooth and creamy. Empty the mixture into a bowl, add the thyme and season with salt. Place the mixture into a baking dish and bake for 15-20 minutes until warm; serve hot. I just flagged this on tastespotting and didn't realize it was yours. I think my DS will love this!